For many people, outdoor dining is one of the pleasurable aspects of summer life. When the weather is accommodating and pleasant, family and friends can congregate and share a meal al fresca in touch with nature and the elements. Depending on how they wish to outfit the facilities, they can now enjoy all the epicurean delights from outdoor appliances normally associated with their primary indoor kitchen. 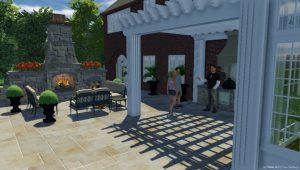 To adequately design outdoor cooking and dining activity, a great deal of thought must go into consideration of the space under consideration. How large the size of family, frequency of entertaining, seperate areas for different meals, shading needed etc. Typically the location selected is a function of who will be the primary cook. If it’s a family member, location with proximity to primary kitchen is desired. If not, it can be placed in a more discreet location. Practicality also plays an important role when designing outdoor cooking and dining areas. Eating in a shaded area is always preferable, be it tucked amid a grove of trees or under a pergola structure, awning or umbrellas. For areas where it often rains, perhaps a solid roof structure will be considered.